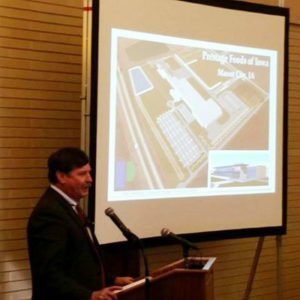 Construction is now passing the two-year mark on the massive Prestage Farms pork processing plant in north-central Iowa. Ground was broken near Eagle Grove in July of 2016. Other arrangements are being made, like working with Unity Point to provide health care to the staff along with an in-house medical clinic. Initially, the plant will slaughter 10,000 hogs per day, with half of those hogs coming from Prestage’s own barns. The other half will come from independent producers. The 922 workers is for the first shift only. It may be a year or two before it’s determined whether a second shift will be created.